Grey is the New Black: How to keep up with Grey Literature in the Academic Library? BLAKE, Aleksandra (2017) Grey is the New Black: How to keep up with Grey Literature in the Academic Library?. Paper presented at: IFLA WLIC 2017 – Wrocław, Poland – Libraries. Solidarity. Society. in Session 112 - Poster Sessions. Grey literature is everywhere, consisting of documents that are not formally published through typical scholarly channels. Many researchers refer to the task of locating grey literature as finding the proverbial needle in a haystack. Government agencies, universities, corporations, research centers, associations & societies, and professional organizations produce those resources in collaboration with practitioners and researchers who are experts in their field. It generally consists of statistics, facts, and other specialized information not found in traditional scholarly publishing. Despite the fact that grey literature is not considered scholarly, it is an important source of information to students and researchers in different areas of study and is important for balanced collection development at academic library. Research in an academic environment is a complex practice of planning, designing and reflecting. 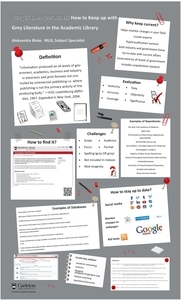 This poster will take you on a journey through the research process that leads to grey literature. It will provide the viewer with an idea of how to search for and discover relevant resources for grey literature, and demonstrate how the library staff at Carleton University is adding these resources to their collection by cataloguing and preserving it. Specific examples will be displayed, along with brief commentaries. The poster will include a combination of text and screen shots taken from Carleton’s online library guide. 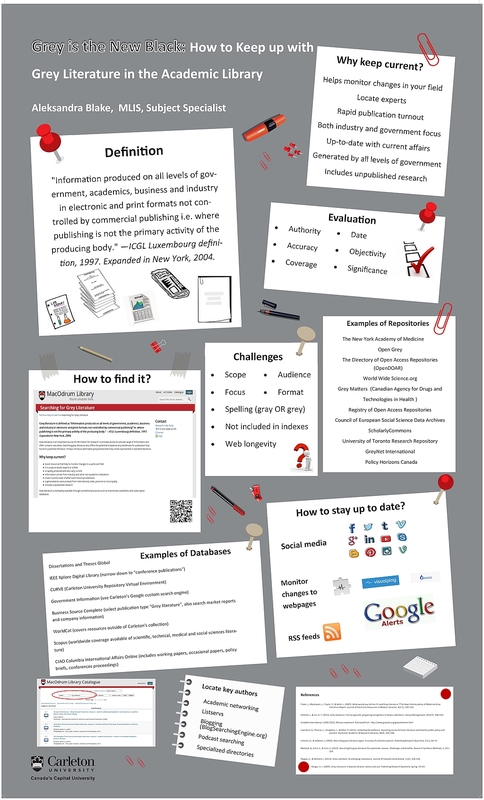 I hope that this poster will be of interest to those involved in collection development as well as research and information literacy. Grey literature connects academic libraries and students with civil society by providing access to this information, which they might not otherwise know about.